‘Injections “while you dance”, Manchester Guardian (8 April 1959), p. 4. An “injections-while-you-dance” scheme is to be operated in Bristol to encourage immunisation among the under 25s’, noted the Manchester Guardian on 8 April 1959. ‘In clubs and halls dance records will be interrupted for propaganda announcements’. Just four days earlier, footballer Jeff Hall, England international and Birmingham City right back, had died from polio. Aged 29, he collapsed after playing a match at Portsmouth on 21 March. That such a young, healthy man could be struck by a disease traditionally described as “infantile paralysis” shocked the nation. 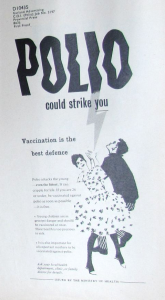 In many parts of the country, young people presented themselves en masse for polio vaccination. So great was the sudden upswing in demand that in some districts they ran out of the vaccine. Health authorities were glad that so many young people wanted to be vaccinated. They seized upon the opportunity to promote it to their target demographic – 15 to 26 year olds. But the authorities were also somewhat frustrated that young people had not registered for the scheme when they were originally asked. If they had, the limited supplies of vaccine could have been distributed much more evenly. 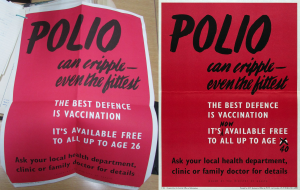 Hannah Elizabeth and Gareth Millward will be discussing posters like those you see here, and other “propaganda” efforts – such as vaccination drives at dance halls – at the IHR Life Cycles seminar on 9 October. They formed part of a much wider and longer campaign against polio that began in the mid-1950s and continues to this day. However, the years between 1955 and 1962 were the most intense. They involved a British vaccine delivered by injection – not the bitter-tasting drops on a sugar cube or jelly baby that many might remember. But British pharmaceutical companies had significant difficulties producing enough vaccine to immunise British children and young adults. Hannah and Gareth will discuss why this was on Tuesday. 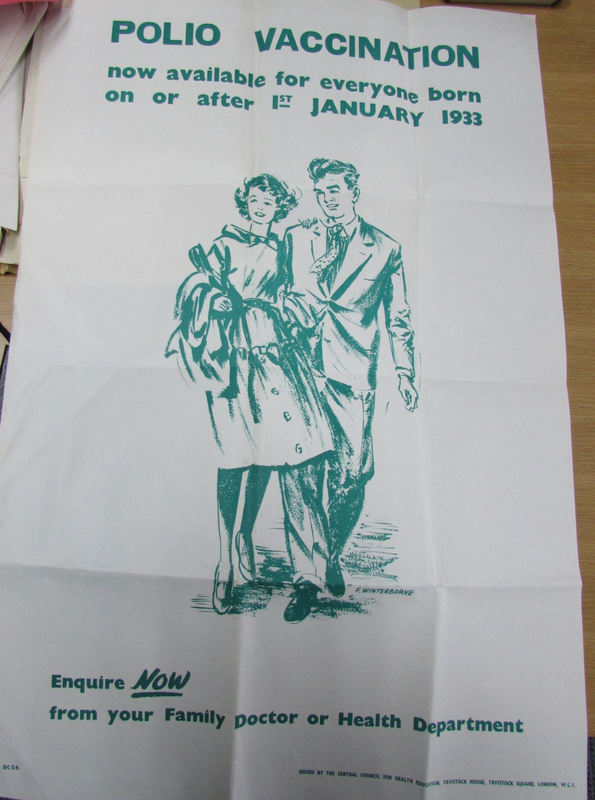 The National Archives: MH 55/2212, Central Council for Health Education poster, c. 1959. As important as this political context was, perhaps the more intriguing issue is how the Ministry of Health leveraged emotions in their advertising aimed at parents and young adults. The vaccine was released in phases – first for children, then for adults aged 15-26 and then for everyone under 40. This also resulted in different phases of advertising. By tracing the emotions in these propaganda materials, we can examine how the British public responded to polio vaccination and how health authorities imagined the decision-making processes, attitudes and desires of their target audiences. 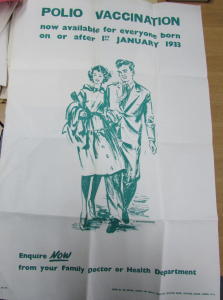 They played on existing fears about polio, hopes for modern medical technology, the growing freedom of “teenagers”, life aspirations of (potential) mothers and fathers, and a sense of national solidarity in the post-war welfare state. 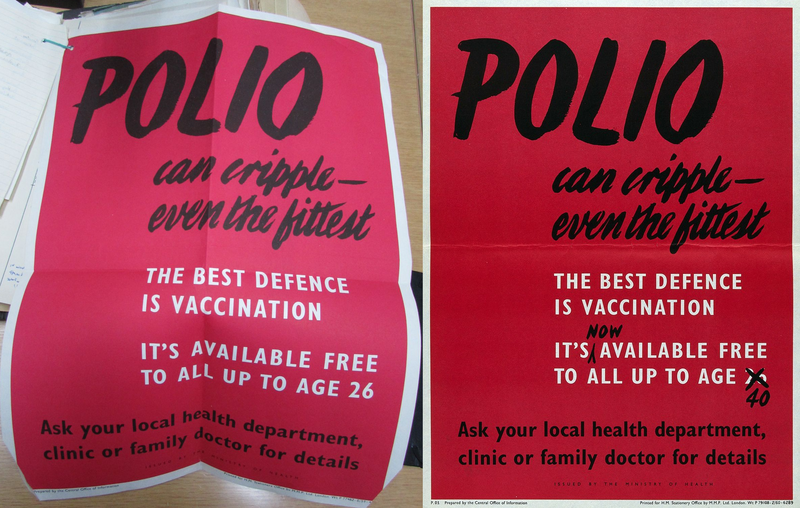 Left: The National Archives, MH 55/2212, Ministry of Health poster 1959; Right: Wellcome Collection: Ministry of Health poster, 1959. The other option you have is to watch this 1961 film by Pfizer Ltd on the oral polio vaccine which replaced the Sabin injectable vaccine.